I’ve noticed that some rather popular sewing, quilting, and craft blogs do the occasional giveaway, when people get to possibly win a box full of fabric scraps or a handmade apron simply by commenting on the post or linking to the blog. For example, rae gun ramblings has a currrent giveaway for some Japanese fabric. I think the appeal is the hoped-for thrill of winning and the delight in getting a package in the mail. Everybody loves getting personal mail, especially if it’s something pretty. So I was thinking that maybe sometime I could do my very own giveaway of something way totally awesome, so that somebody who reads and comments could get something way totally awesome in the mail. Yes, that probably means it would be you, Mom. Would anybody else be interested? Tonight I’ll finish piecing the baby quilt. 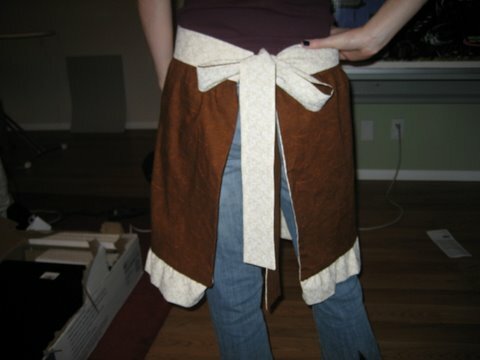 If that takes less time than expected then I’ll turn a red skirt into an apron. I love aprons! Here’s one that I made for an apron swap by Yarni Gras! last fall. It’s my standard fully-reversible option I’ve developed since first learning the basics from the great lululollylegs tutorial. The theme was Hot Drinks for Hot Mamas — luckily I didn’t have to be a literal Mama to take part — and my partner’s favorite beverage was hot chocolate. Coincidentally, check out the pictures she just posted on her blog of her astounding sewing space that absolutely does not need to participate in the Great Space Clean-Up of 2009. July 24, 2009. 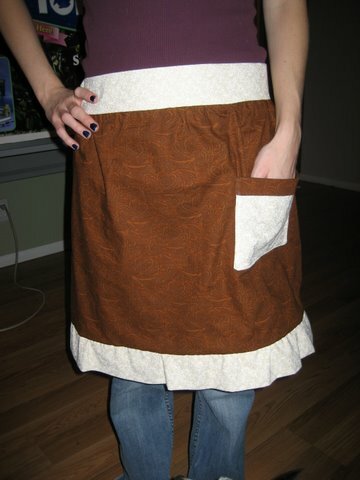 Tags: apron, completed project, giveaway. Links, Projects, Words. hey! thanks for the shout-out about my creative space! I still love the apron you made for me 🙂 it’s one of my favorites. July 24, 2009 at 9:38 pm. Permalink. Me me me. Uncle Sandy would look silly in an apron hahaha. July 25, 2009 at 5:43 am. Permalink. I’m in! I’m in! This just gets better and better! July 25, 2009 at 5:01 pm. Permalink.